You are at:Home»Great Falls Montana»Around Town»Back To School Gift? Almost time for “back to school” — shopping for new clothes, school supplies, and such. 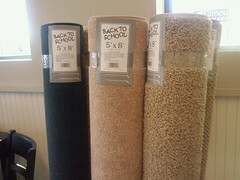 And now you can add another item to your must-have list…because nothing says “Back To School!” better than…a new area rug? Seen at Smith’s in the Marketplace. UPDATE: once again, my readers have displayed more wisdom than me…never occurred to me that “back to school” applies also to “off to college!” Thanks, gang. In fairness, the right-sized area rug could dress up a dorm room somewhat. yep, when I went off to college, a good area rug was at the top of my list. Dorm rooms generally don’t have carpet and have cold, hard vinyl tile. Not fun! So Dave here hasn’t sent any of his girls off to the University yet….dorms=empty space one must fill with stuff the parental units can barely afford!